Now that you're stuffed full of turkey and dressing, it's time to go out and brave the crowds for Black Friday deals. Or if the thought of trampling people to get 20% off doesn't wet your whistle, here are some awesome Netflix Instant titles to tide you over for the remainder of the holiday weekend. 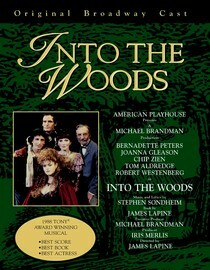 One of Sondheim's classic musicals. It tells the tales of many fairytale characters, but with a dark twist and edge. This has been one of my favorite musicals to see on stage, and lucky for us, Sondheim is one of the few composers who allow his musicals to be filmed while they're still on stage. None of this conversion to movie business. A documentary fit for the whole family. 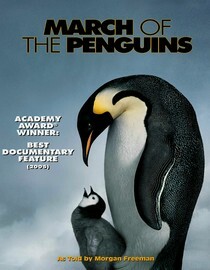 It tells the story of the emperor penguins as they endure one of the harshest places on the planet, Antarctica. The film is voiced by God himself, Morgan Freeman, and is a great introduction to the documentary format for young film connoisseurs. One of my absolute favorite cheesy action movies. Scientists have been performing experiments on sharks trying to find the cure for Alzheimer's. 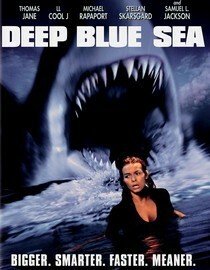 However, the sharks become more intelligent, and you guessed it, start fighting back. Not suitable for children, but it has my favorite death of all time. (You'll know it when you see it).